A council leader has denied a threat to its schools music service amid claims it faces a budget cut of two-thirds. Campaigners in Ceredigion fear job losses among the music tutors who teach instrumental lessons in schools and organise bands, choirs and orchestras. 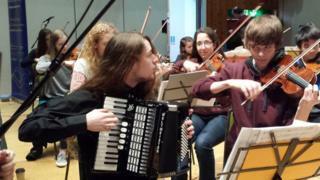 Friends of Ceredigion Young Musicians secretary Angharad Fychan said it could "rip the heart" out of music-making. Council leader Ellen ap Gwynn said the service may be restructured but no decision on funding cuts had been made. Harpist Catrin Finch is among those who have come through the system which the campaigners say benefits more than 1,200 children in the county. Funding for county-wide schools services - which includes music tuition - will be cut by £250,000 in the coming year as the authority seeks to balance its books. But the campaigners claim a source has told them the music budget is set to be slashed from £495,000 to £160,000. Ms Fychan said: "We all know that these are tough times for local government, but how is it fair to single out this service for such enormous cuts, which threaten to rip the heart out of music-making among Ceredigion youngsters?" Councillor Ceredig Davies, leader of the Liberal Democrat opposition in Ceredigion, called for clarity from the Plaid Cymru-led cabinet, saying: "There are real concerns out there." Ms ap Gwynn replied that, despite the speculation, no decision had been made yet. "There is no intention to cut this service completely but perhaps we need to restructure how the scheme works," she said. The council told the Local Democracy Reporting Service that Ceredigion had the highest-funded music service in Wales, and denied "incorrect and misleading reports" that the provision would cease. "The aspiration is to maintain provision and performing opportunities but at the same time reducing overhead costs and ensuring better value for money, as with every other service across the council," a spokesman said.